We have a 100% guarantee on sizing. You are guaranteed free resizing during the first year, regardless of why you may want your ring resized. After you get your ring, you might change your mind about how you want it to fit, especially if you are not used to wearing rings. We don’t want sizing changes to be an issue for you, which is why we will resize your titanium ring for free during the first year (you pay only shipping). Sizing is a critical issue for online ring sales, especially titanium rings. Even if you know your size, we will send you our own sizers to measure your finger. Why? Because those metal sizing rings that jewelers use are not standardized. The differences between different equipment can be significant. We can resize titanium rings smaller or larger! You may have read elsewhere that titanium bands cannot be resized. We are fanatical about fit and have developed techniques for both enlarging and reducing the size of titanium rings. 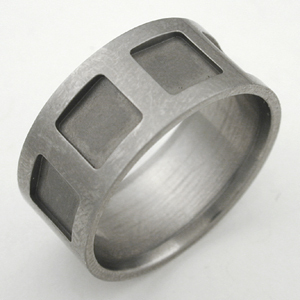 A titanium ring, before resizing. 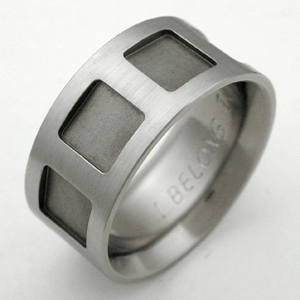 A titanium ring, after resizing. To qualify for our free resizing, you must specify your size using our free finger sizers, which we send you upon your order and which you do not need to return. If you have any questions about our ring sizing policy, please feel free to contact us.